The RadiumOne Breakfast is certainly one of the can’t miss events of the AdWeek programme, always promising interesting, pertinent discussion in a unique setting from some of sport’s most engaging speakers. 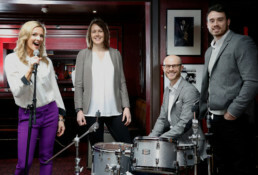 LSM were appointed by RadiumOne to source and manage the sporting talent – host Gabby Logan, and Olympians Kelly Sotherton and Kristian Thomas who sat alongside the Head of Legal and Commercial at Team Sky, Hussein Fahmy. LSM also provided event support for RadiumOne on site. The event was titled The Olympics and Data: Running Rings around the Competition and all panellists agreed that data was absolutely fundamental to training improvement and competitive performance, and that its use will be the fastest growing development for professional athletes and sporting bodies. With less than 100 days to go until the Rio Olympics kick off, having insight from two Olympic medallists ensured that the event made a real impression on all of those in attendance at Ronnie Scotts Jazz Club, many of whom left agreeing that this was RadiumOne’s best AdWeek event yet.